Continuing on from my last post, I found another great use for Pidgin! GTalkSMS is an Android app that turns your phone into a chat bot. 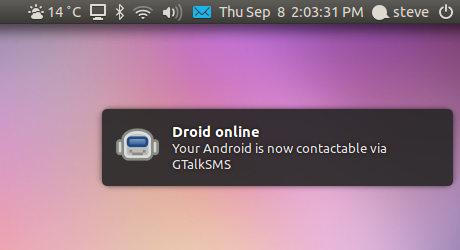 GTalkSMS enables you to control your android phone through GTalk/XMPP (send/receive SMS, make calls, locate your phone, etc.). It can be useful for those who prefer typing sms on a real keyboard. The app also notifies you about new “events” on the phone, like a new text message (SMS) or an incoming call. With this done, once I start the bot, it will send me a instant message when I get an SMS, phone call or the battery state changes. That will lookup mymate in my phonebook and send the SMS to them. Some other cool commands allow you to change your ringer volume, take a photo, share clipboards, get geolocation, launch a given URL in the browser and lots more. It also has some options to make GTalkSMS start automatically when the phone boots, or when it is charging, or when its on wifi. I personally only want this connected while I’m in front of my pc, so I have it set to start when charging and stop when not charging anymore (I use a USB charging dock at my desk). One other noteworthy feature is the “Incoming SMS” setting ”In separated conversations”. When you receive an sms, not only does the bot send you an IM, but it will start a new “chat room” for that particular contact and send you an invite. From within this chat room, you dont need to worry about sending commands, whatever you send in there will be sent as an sms to that client. It makes it look seamlessly like any other chat. 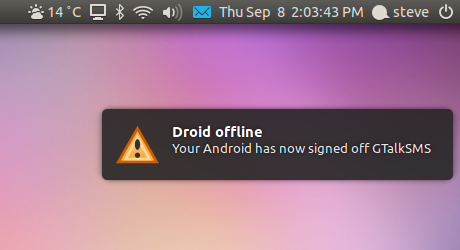 As you may already know, I like Pidgin because of its configurability. I have Pidgin using the libnotify plugin, which means I get the fancy Ubuntu notifications from Pidgin, but I soon realised there are too many notifications by default (everytime a buddy signs in or out is a bit much with 4 chat accounts signed in at once!) - so I turned those notifications off.